I've never been a waiter, so never had the privileged of being amused by story after story told hush-hush by patrons. I have to imagine though that (however hard) working in a coffee shop, or restaurant of sorts must have it's entertaining moments. 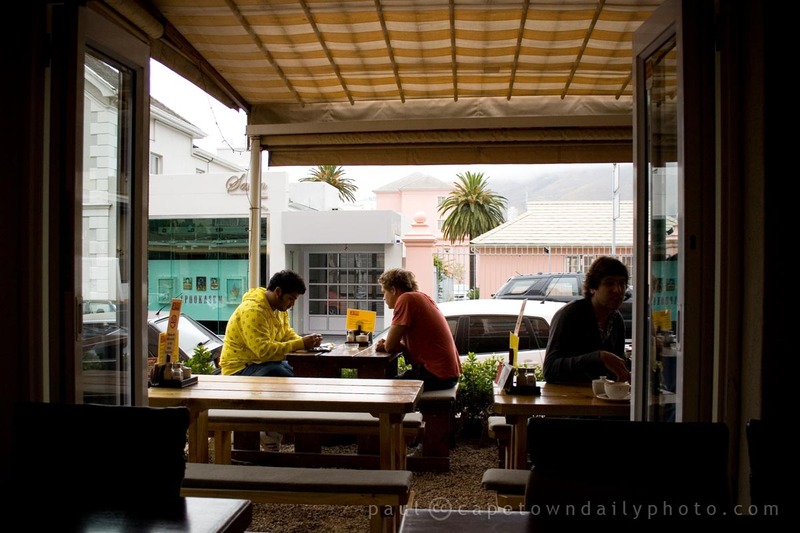 Kerry-Anne and I stopped in for breakfast at Arnolds in Kloof Street (map). The meal was good, but I have to advise you that, unless you like super-super strong filter coffee, you rather order cappuccino. Gosh - the coffee really was that strong. Posted in Street photography and tagged restaurant on Monday, 19 April, 2010 by Paul. The early-bird R15 special is at 06h45 if I’m correct – right Strauss? The Early Bird is R11! Thanks for visiting CTDP Arnold. What time is the Early Bird breakfast?